A true Seminole burns with passion both on game day and during the off season. Maybe you weren’t immediately a football extraordinaire before coming to Florida State University, but now that you’re in Tallahassee, the Nole life infected you with pride. Florida State football isn’t just a Saturday sporting event. FSU football causes you to lose your voice and makes sweating besides thousands of other Seminoles 100 percent worth it. Watching our Seminoles slay at the stadium compares to nothing else. You can’t be a true Seminole until you show dire dedication at Doak Campbell Stadium. If a game starts at 7:30 p.m., you start getting ready at 2 p.m. because you need a hefty amount of time for tailgating. “[My friends and I] get there two hours before the gates open, which is two hours before the game starts. So four hours before the game starts total,” said FSU senior Mya Frieze. “For a noon game, that means getting there at 8 a.m. which is not fun, but we usually get really amazing seats and being so close to the action and feeling like we are connected to the players and the team is totally worth all of the waiting around.” That sounds like dedication to me. Any fan of FSU football would immediately recognize the FSU Checkered Boys and the Garnet and Gold Guys. How does it feel to get so much air time on ESPN? “The best part has to be taking pictures with people. We have little kids in their Nole gear asking to take pictures with us all the time. We feel like celebrities and everyone is excited to get a picture with us and it feels good to create a memory for someone,” said Dalton Carter, FSU senior and fourth-year Checkered Boy. “We get to make fools out of ourselves for the entertainment of others while showing our true colors as loyal Seminoles.” Whether you adorn yourself in contemporary, Seminole-themed tattoos and the occasional war stripes or you use six pounds of glitter to get ready for a game—you know anything goes on game day. Built with more than three million bricks, the stunning stadium holds approximately 84,500 people, making Doak the 20th largest stadium in the NCAA and the largest in the ACC. 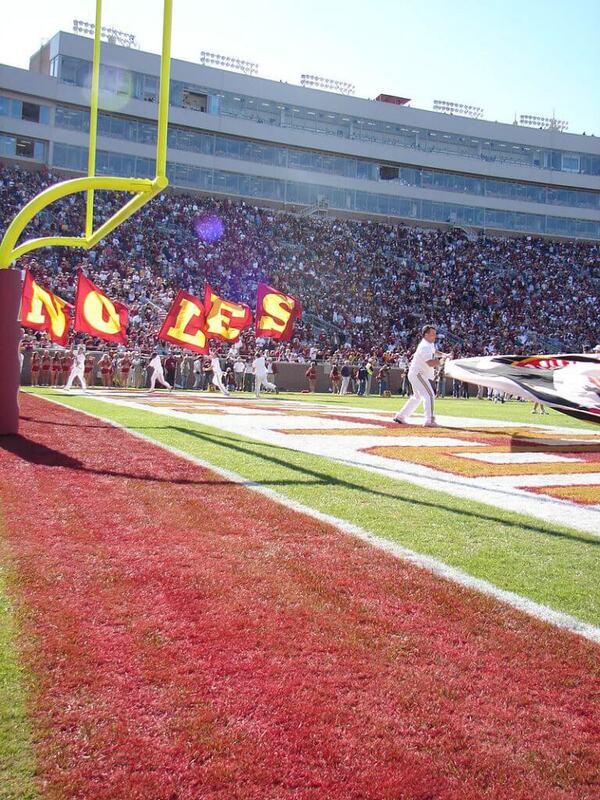 “I love the atmosphere of Doak. There is something so special about having thousands of Seminoles cheer the Noles on and it is a beautiful thing,” said FSU alumnus Josh Karadeema. Seminoles have waited patiently for the stadium’s additions, and come Saturday we will finally realize the wait was worth it.“[The new scoreboard is] one of the biggest in college football…The NFL only allows one sub-woofer, but because we’re Florida State and it’s college football, we got two…Finally, with the addition of the new Champions Club, the stadium actually retains its sound better. So when we’re cheering, the noise will stay in the stadium, creating an even larger home field advantage than before,” Karadeema said. Pumped yet? Tailgating at 9 a.m. might not be your cup of tea, but it sure beats waking up for class, not to mention the head start you’ll get on beers and burgers. “I don’t even like football very much but I love Florida State football. The entire season consumes you and you feel this sense of community you won’t feel anywhere else. That’s why you get up every game day, because you crave that feeling and that energy. You want to go out there and support your Nole family at any hour every game day,” said FSU senior Melanie Marquis. The sense of community in Tallahassee might stem from gathering around a grill with a few cold ones, but any Seminole knows a little party never killed nobody. You don’t attend Florida State without understanding the popularity and respect Bobby and Jimbo deserve. Jimbo Fisher stands as one of the best coaches in college football; he’s full of life and passion, going above and beyond to prepare his players for the NFL. Bobby Bowden, an FSU legend, remains beloved by all FSU fans for building the program we love today. “Both of my parents attended Florida State which is where they met, and then they got engaged at Lake Ella and raised me with their love of Florida State,” said TCC senior Kelsey Morse. “From the time I was little I wore the FSU onesies, learned the War Chant and Fight Song. 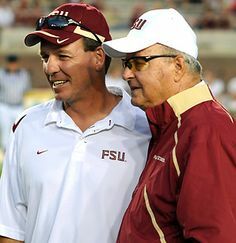 But most importantly, was taught to revere Bobby Bowden…Meeting him has been a dream of mine my whole life.” For Seminole’s sake, will somebody please introduce us to Bobby Bowden ASAP? As a freshman, you sit inside your dorm on a Friday night and you hear a concert outside your window. You look out of your blinds and see hundreds of people outside holding instruments, singing, dancing and war chanting. This vision becomes reality the night before the first home game of the year. “Campus Crawl is when the Chiefs walk around campus and play school songs as loud as humanly possible by the residence halls. We want to wake everyone up and let them know that it’s game day,” said FSU sophomore and Marching Chief Kimberly Vasbinder. 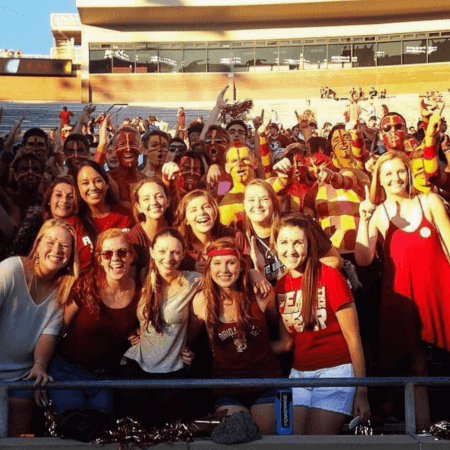 “I love it because we get to be annoying but at the same time it gets everyone super pumped.” For the 2016 season, look out for the Marching Chiefs the night before the Clemson game, October 29. For the umpteenth time, “What? What?” doesn’t exist in the fight song. The purpose of the pause after the “E” in “F-L-O-R-I-D-A S-T-A-T-E,” offers a blissful moment of silence for a clean echo that fills every Seminole with a sense of pride. “Adding a cheesy statement like that to an epic song turns it into some whitewashed jingle. 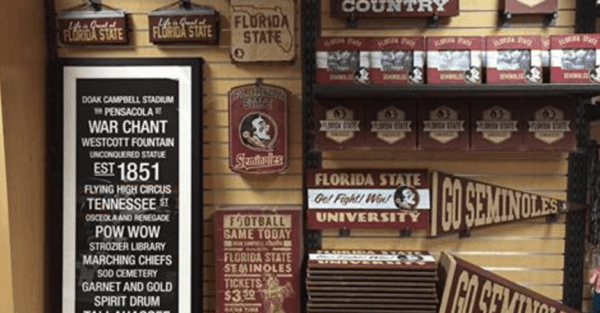 So many people feel the need to change things that have been around forever, but when it comes to the FSU Fight Song, that’s where our fan base should draw the line,” said FSU alumnus Andrew Cafiero. At first, the extra wording seemed endearing, but dear what-whatters, stop. “I feel so much pride as a Seminole! 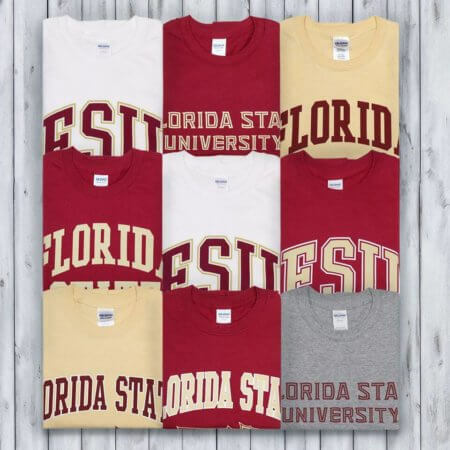 It doesn’t matter that I already own like 100 different FSU tops, every time I walked past the bookstore as a student, I had to stop and in to grab a new one,” said FSU alumna Katie Kinsella. “Even now as an alumna, I find myself gravitating towards any shade of garnet while shopping because it gives me comfort to know I’m reppin’ my Noles wherever I go.” Without fail, you convince yourself you need those refrigerator stickers, the Tervis with a spear, a 14th FSU banner, garnet and gold salt and pepper shakers, another FSU hat and those Seminole lawn chairs you’ve been eyeing since March. The lack of effort used for one swipe makes the purchasing that much easier. Keep your credit cards at home, ladies and gentlemen—0r don’t. You should probably buy those decorative pillows, too. Above all, the sound of the war chant brings spirited vibes to any true Seminole. “[The war chant] feels like we are one body. All our differences are forgotten as soon as the first hand goes up and the chant begins. 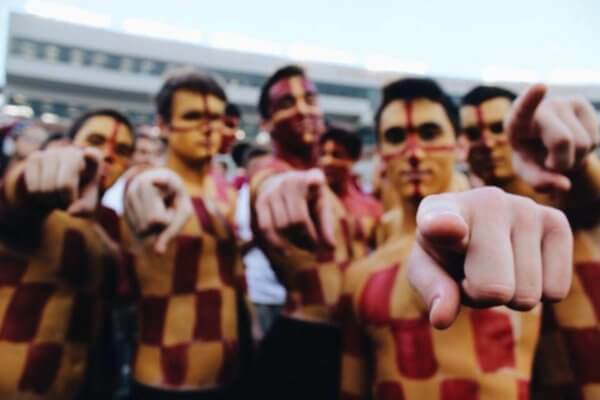 We aren’t separate individuals, but one heart beat with garnet and gold coursing through our veins. The war chant is a symbol of our strength and unity. The vibrations can be felt throughout the whole stadium as we stand together and chant,” said Florida State alumna Nikki Cline. Standing in a sea of garnet and gold at Doak Stadium while screaming the war chant epitomizes the meaning of being a Florida State Seminole. Through the Florida heat, spontaneous rain and unbearable cold, “Go Noles!” reigns supreme in every student’s heart at this university.